Francesco Rossi joins forces together with MTV Europe’s Belgian Artist Of The Year nominee Ozark Henry to deliver his new single ‘Godspeed You’, the follow up to his former Ibiza 2013 DJ Awards Track Of The Season and Pete Tong’s Essential New Tune ‘Paper Aeroplane’. ‘Godspeed You’ is a punchy four-on-the-floor track for late nights or early mornings. The fusion of all genres, from deep house to modern pop, make this track pretty distinctive. Remixes are provided by Grammy winning DJ/producer David Morales, who gives the original a house twist, whilst Germany’s Martin Buttrich lays down a deep, tech house rework designed for the late night dancefloor experience. The positive sun-kissed vibe, coupled with the emotional and epic vocals do everything well while its “Godspeed” chorus adds to its appeal. This could be another summer biggie. Pete Tong’s Future Star Francesco Rossi is a successful touring DJ. Originally from Tuscany in Italy, he’s played at the biggest clubs and festivals worldwide from Ultra Music Festival in Miami to Street Parade in Zurich and Pukkelpop in Belgium and Pacha and Amnesia in Ibiza. Ozark Henry is a strong cultural icon across music, design, fashion and cinema in his home country Belgium. His latest Single ‘I’m Your Sacrifice’ released on D:VISION last winter went Platinum in Italy and is now set for a full release via Ultra / Sony Music US and Island Records UK. The duo showcase their skills again, producing music to a high standard with a keen sense for big moments. 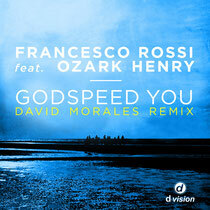 ‘Godspeed You’ is out now on D:VISION with the remixes released on 22August, check it out below.